Centipede was released for the arcade by Atari in 1980. It’s a game where you swerve back and forth as you fire at bugs and try not to get eaten. Halt and Catch Fire featured it in its very first episode and again in last night’s series finale, proving once and for all the show is more than just the sum of its characters and the cultural time capsules they interact in. Saturday night’s series finale was, like most of the last season, quiet and understated. The show has been winding down for some time now and yet still managed to stick the landing without giving itself over completely to cliche. The show has always excelled at feeling true despite its sometimes cornier side, in part because of how it uses technological objects and the media they transmit to anchor the characters and their complicated emotional baggage to a world outside themselves. The show’s writers hauling out an NES in season three or an SNES in the beginning of this one weren’t gimmicks but small, relateable truths born of the sort of specificity that comes from interacting with an object for days, weeks, or even years. Packing up Gordon’s belongings in episode seven was more than just a chore for the remaining characters, it was a sort of communion, hence Joe’s determination followed by guilt when he fails to get his late friend’s jacket back from a donation pile dropped off at Goodwill. In the Halt and Catch Fire’s first season the characters walk out of a showing of Return of the Jedi at one point to help place events on a timeline. It’s a nod to something instantly recognizable and personal (where were you the first time you watched Luke make amends with Vader?) but it’s also a bit hollow. Compared to the physical stuff that acts as a binding agent for the disparate elements of our lives and which slowly trace their histories over time as they wear, fade, and grow old along with us, a movie title displayed on a sign is just an incomplete echo. It’s the difference between Star Wars as a universalized cultural phenomenon and Star Wars as a collection of generic VHS tapes with poor hand writing scrawled on the labels stored in the closet for a rainy day or when the kids are home from school sick. “I feel like we wanted to make her representative of the wave that was coming next, both generationally and technologically,” said the show’s co-creator, Christopher Rogers, in an old interview. “To us, games were that, and Centipede felt just the right blend of addictive and frenetic to mirror Cameron’s mental state in those pilot scenes.” In the first episode Cameron guns down fleas and spiders while entertaining Joe McMillan’s overtures in a dive bar. It’s a reminder that 1.) it used to be perfectly normal to see commercial spaces dotted with monuments to bizarre video games and 2.) video games used to be thought of as something both new and cutting edge, stumbling toward the unknown (far from the exacting design practices of modern day gaming endeavors). It’s not until later in the episode when Cameron gets kicked out of the bar for using a trick coin to game the machines that she ends up agreeing to go work in a sea of beige cubicles alongside the people who will become her future surrogate family. The fluorescent pastels of the Centipede machine aren’t just there to telegraph a place and time, they’re also a tool of existence used by the Cameron to filter through the rest of reality and organize it. It helps that Centipede was a game mostly created by Atari’s only woman programmer at the time, and that she, Dona Bailey, was never properly credited for it, foreshadowing the ongoing struggles that will plague Halt and Catch Fire’s all the way up and through the fourth season. More than just its symbolic importance though, or its usefulness as a prop for actors still sorting themselves out early in a new prestige drama’s run, the arcade cabinet serves the same function it has for the millions of people who have at one point played that or one like it: a box of metal and wood you can escape inside and see yourself reflected in, static and unchanging while the world swirling around it marches on unabated. That’s the magic that Joe hopes to tap into when he wheels one into the Comet work space in episode nine, “Search.” Gordon is gone and Cameron’s getting antsy. The future he thought he was chasing after, both creatively and emotionally, is beginning to transform into something that threatens to be both unrecognizable and beyond his ability to hold onto. 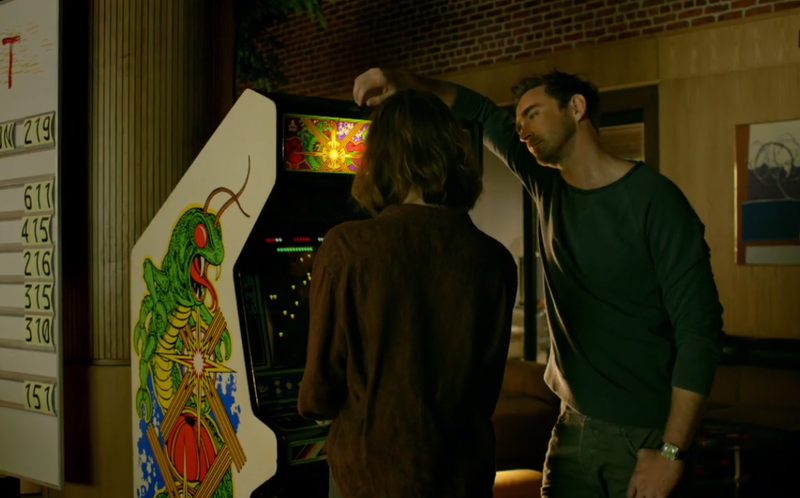 As a result, and under the guise of “bribing” her, he installs a Centipede cabinet in exchange for one last team-up. He needs her help to make Comet compatible with the next hot web browser coming down pipeline and also possibly knows on some level that she needs him to need her. The sound card’s busted but otherwise it runs great he tells her, even asking her to play a game with him despite her wide-eyed surprise and concern over his desperation. Lee Pace and Mackenzie Davis have developed such subtle chemistry at this point they’re able to make what should on its surface look like a warm moment of two friends and lovers playing together instead appear like the pathetic last gasp of a relationship beyond repair, while both of their backs are turned no less. Later that night it’s revealed that the browser they’ve been chasing after to integrate with has already signed on with Yahoo!, sinking Comet’s future prospects and with them any last hope for Joe and Cameron to salvage their partnership. Their final breakup, delivered in so few words and with only the slightest hint of sentimentality, would have been an achievement on its own. For Halt and Catch Fire, however, the real emotional gut punch comes a few scenes later when Joe is slouched over machine alone as the company he built with what became his best friend begins to close up shop. If you’ve only watch the most recent season, it’s a nice callback to his earlier gesture. Over the course of four seasons though, it becomes something much more. It plays to the strengths of television’s multi-seasonal character arcs, but also Halt and Catch Fire’s unique affinity for unwieldy people and the refined technological artifacts they pour their brokenness into. Maybe if Joe finds an old Centipede machine he can turn back the clock and start over again, reset things as it were, and partition off a small space where the losses and failures Cameron and he have suffered can be cut loose. There are two other times over the course of the show where some version of this fantasy has played out. Season two opens on Joe staring into a mirror as he fixes his hair and puts on his suit. Out in the living room Cameron’s playing Indy 500 and invites him to join her. “Come, it’s not as much fun to beat the computer,” she says. It’s not real though, or at least not anymore in the context of the show. Joe ruined his relationship with Cameron at the end of the previous season, and as he kisses her goodbye and leaves the house it morphs into the headquarters of her and Donna’s burgeoning subscription game service, Mutiny. But everything breakdowns or fades with time, and by the early-to-mid-90s their relationship has become obsolete, like the circuit board housing the game Joe hoped might offer what as left of their connection refuge from the forces working against it. And while Halt and Catch Fire offers each of its main characters resolution in the form of self-reinvention—upgrades that will make them adaptable to the new chapters in their lives—the show’s biggest accomplishment is keeping the messy histories that took place before intact and ever-present. In Halt and Catch Fire, tech objects don’t just create human connections, they serve as physical records of them. Like the Centipede cabinet or even John’s old Cardiff Electric radio camouflaged in a box of memorabilia, it’s all still there lurking in the past, always ready and available to be re-tooled or revisited, even if it ultimately can’t lead to new possibilities. It’s why the show does such an excellent job of making you excited for the potential in a new collaboration between Cameron and Donna even though the characters had already re-traced the ultimately futile arc of what a new partnership would could mean. The gang could always get back together, even though we know it won’t ever last.